This illuminated manuscript is the opening page to a two-volume work known as the Denton Black Book [SGC IV.B.2 & 3]. As with the similarly named Black Book of the Garter, the name refers to the colour of the books’ bindings, which are done in dark morocco – a material known for its durability and beauty, made from goatskin and often died strong, dark colours, in this case black. Denton’s book was compiled during the first quarter of the sixteenth century and contains hand-written copies of some of the documents that were most important to the College of St George at the time, including Papal Bulls regarding the privileges the College was granted over the land of St Anthony’s Hospital in London and the monastery of Bec Herluin in France, and documents recording the foundation of chantries, including the Exeter (later Rutland) chantry and the Hastings chantry. The arrangements made by such documents and the lands and privileges they granted were the main source of the College’s income. This meant that preserving the documentary evidence of the agreements was vital. 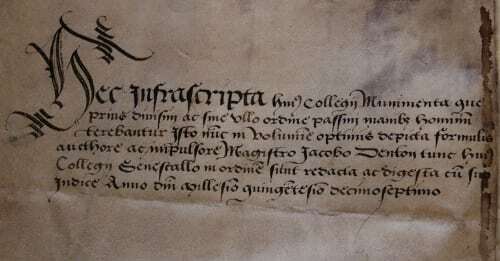 It is explained in the preface to Denton’s book that huius Collegii munimenta – the documents of this College (a ‘muniment’ is now defined specifically as “a document, such as a title deed, charter, etc., preserved as evidence of rights or privileges; an archival document” by the Oxford English Dictionary) – were in volumine optimis depicta formulis aucthore ac impolsore magistro Jacobo Denton, tunc huius Collegii Senescallo – copied into this volume on the orders of James Denton, steward of the College – to prevent them being manibus hominum terebantur – worn away by people’s hands. 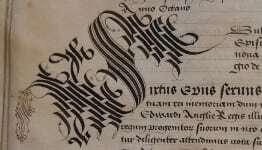 Nowadays we would be inclined to make a digital copy of an important or delicate record so that people can work with the surrogate and avoid the risk of damaging the original, but the sixteenth-century solution to this problem was to write out another copy by hand. To our eyes now the copy looks just as valuable, but at the time the legal significance of the originals and their implications for the College’s fortune would have been worth far more. James Denton had been made a Canon of Windsor in 1509. This was just one of many preferments he was granted during his life; he also did much service for the Royal family and was one of the royal chaplains present at the Field of the Cloth of Gold in 1520. 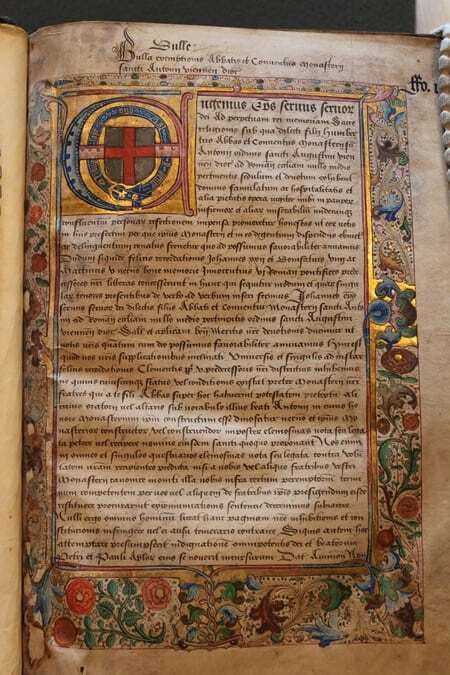 His work with the muniments of St George’s was repeated with the records of his alma mater, King’s College, Cambridge, where the most important documents were copied into the Liber Denton. During his lifetime, Denton developed a reputation as a good man; he served on commissions and councils that worked for peace and justice, he was generous to his servants and helped them to have their sons well-educated. Between 1517 and 1520 he spent almost £500 for a house to be built, furnished, and endowed within Windsor Castle at a cost of nearly £500 so that the chantry priests and choristers would have somewhere to eat their meals. That building has not existed for many decades, but the ground on which it stood is still known as Denton’s Commons. In his will he left funding and instructions for distributions of bread and clothes to be made to the poor of the town. This page is the only one of the Denton Black Book to be so lavishly decorated, exhibiting many different coloured paints as well as gold leaf and decorated with the Tudor roses of King Henry VIII’s house and the pomegranates that symbolised Queen Katherine of Aragon. The penmanship throughout the book, however, is clearly very skilled and each document is begun with an elaborately designed initial capital, as shown here at the beginning of a bull from Pope Sixtus IV.